TFG’s @Home Black Friday Campaign: Your VIP pass to shop Black Friday. Be the first. @Home wanted to create excitement during the week leading up to Black Friday, offering their fans an opportunity to receive exclusive deals before anyone else. They released a teaser campaign titled “Your VIP pass to shop Black Friday. Be the first.” The focus of the campaign was to acquire new subscribers, with a follow-up promotional email sent to those who had converted. Run a successful social media campaign for Black Friday deals, with a sign-up form to acquire email addresses. Use the collected email addresses to run an exclusive VIP access campaign. VIP customers from teaser campaign. @Home launched their social media teaser campaigns where they collected email addresses for each sign-up received. Shortly after that these new subscribers received an email, granting them a VIP status, to shop for Black Friday deals 6 hours before they were released to the public. @Home offered their VIP shoppers exclusive access to shop for the best buys on an almost “first come, first serve” basis. The teaser campaign pulled in approximately 5 000 email addresses. The email campaign that followed achieved a click-through-rate of over 8% which is double the CTR the retail industry saw in our last Email Benchmarks Report, and triple of what E-commerce saw. The VIP shopping experience increased sales by 110% on the day of trade. There were several reasons that this campaign was successful, but one of the main factors was it being built around an exclusive shopping experience for a limited amount of time which not only created excitement but also drove a sense of urgency. The campaign was sent out at lunchtime when consumers are generally on a break. 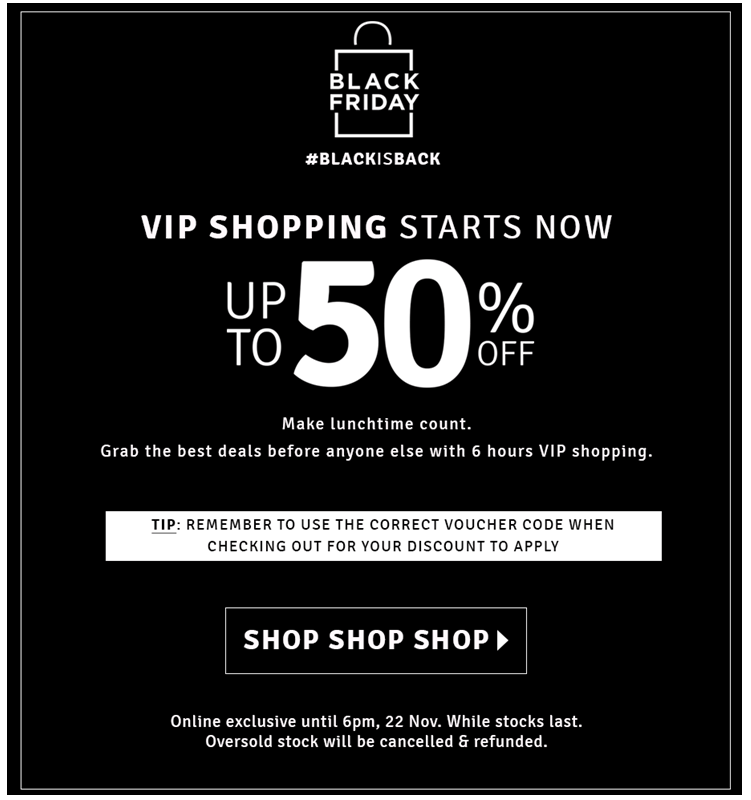 The Subject Line: Your VIP pass to shop Black Friday. Be the first. The subject line included the words ‘VIP’ and ‘be the first’, which evokes curiosity and communicates a sense of urgency compelling the reader to open the email. TFG’s turnover soared to R432million on Black Friday, double last year’s results and more than 50% higher than they had anticipated.